Raw primary sludge particle size distribution is: greater than 7 mm (5 to 20%), 1 to 7 mm (9 to 33%), and smaller than 1 mm (50 to 88%), of which about 45% is less than 0.2 mm. In activated sludge, the approximate distribution is: 90% below 0.2 mm, 8% between 0.2 and 1 mm, 1.6% between 1 and 3 mm, and 0.4% over 3 mm. The organic part of the sludge decays more rapidly, with an increase in the quantity of finely dispersed and colloidal particles and bound water resulting in a decrease in the separation of water from the sludge and poor dewaterability. The density of primary sludge is 1.0 to 1.03 g/cm3, and the density of activated sludge is about 1.0 g/cm3. The density of dry sludge solids is 1.2 to 1.4 g/ cm3. Primary sludge at solids concentrations above 5% and activated sludge at solids concentrations above 3% are non-Newtonian, which means that head losses in piping are not proportional to the velocity and viscosity. They are also thixotropic, which means that they become less viscous when mixed. to 18.4 MJ/kg. Sludge burns at a temperature of 430 to 500°C (800 to 930°F); however, to eliminate odors, the temperature needs to be raised to 800 to 850°C (1470 to 1560°F). In the process of thickened activated sludge digestion, 15 MJ of heat is produced per kilogram of volatile suspended solids. Dewatering is the process of natural or mechanical removal of water from sludge. 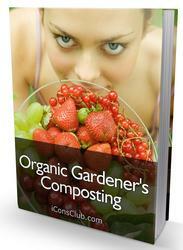 Water may be present in sludge as free water or bound to the particles physically or chemically. The greater the bound water present in sludge, the more the energy or reagents it takes to condition the sludge for removal of the bound water. The separation of water from sludge depends on the size of solid particles; the smaller the particles, the poorer the water separation from sludge. Therefore, any sludge treatment process that reduces the size of suspended solids particles has a negative effect on the conditioning and dewa-tering of sludge. The chemical composition of sludge also exerts a significance influence on its treatment and dewaterability. Compounds of iron, aluminum, chromium, and copper, as well as acids and alkalis, improve the process of precipitation and dewatering and reduce the consumption of chemical reagents for conditioning of sludge before dewatering. Oils, fats, and nitrogen compounds intensify the anaerobic sludge digestion but interfere with the conditioning and dewatering processes. The dewaterability of sludge can be evaluated by measuring its specific resistance, which is determined in a Buchner funnel test by measuring the volume of filtrate collected from sludge and the time it takes to filter. Specific resistance varies depending on the type of sludge and its characteristics; the values are shown in Table 2.6 for various types of sludge. TABLE 2.7 Levels of Indicator Bacteria and Pathogens"
Source: Lue-Hing et al., 1998.
" Values are for raw primary, secondary, and mixed sludge. b Dry weight basis. c ND, none detected. Levels of indicator bacteria and pathogens in raw primary, activated, and mixed sludges are shown in Table 2.7. The diversity of microflora makes it difficult to enumerate the total population. Primary sedimentation and activated sludge treatment of wastewater are very efficient in removing microorganisms from wastewater and transporting them to the sludge. Primary sedimentation reduces microorganisms in sewage by 30 to 70%. After activated sludge treatment, the reduction of microorganisms reaches 90 to 99%. The types of bacteria in activated sludge are mostly floc-forming, but the sludge also contains filamentous microorganisms. An excessive amount of filamentous organisms can cause sludge bulking in secondary clarifiers. Sludge bulking is a condition in the secondary clarifier where the flocs do not compact or settle well, causing large amounts of flocs to discharge with the clarifier effluent. handling facilities for higher values to avoid shock loading to those facilities. Recycle streams from sludge-processing facilities, such as thickeners, digesters, and dewatering systems, must also be included in the mass balance. 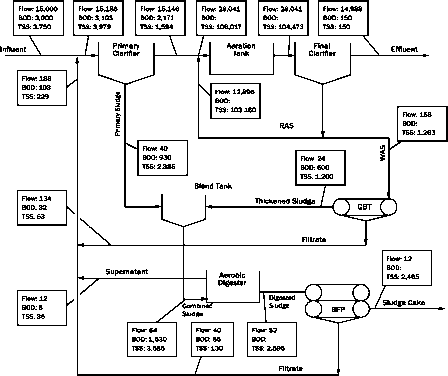 Example 2.1 demonstrates the computation of mass balance for a waste-water treatment plant. Table 2.8 shows the solids concentrations and solids capture efficiencies for the most commonly used sludge-processing units. Table 2.9 shows the BOD and TSS concentrations in the recycle flows from the various processes. There are wide variations in some of these values. 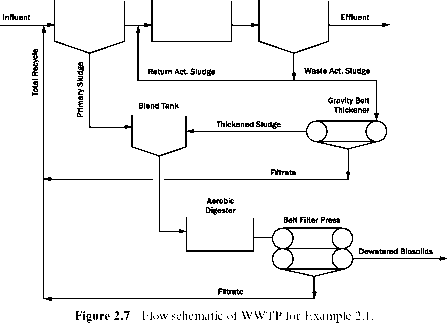 Values for mass balance computations should be chosen based on the data from treatment plants with similar wastewater concentrations and treatment systems. Recycle streams are important in the preparation of solids mass balance. The typical approach to the computation is first to assume a fixed percentage of the influent BOD and TSS in the total recycle flow, based on typical plant data. Then an iterative computational procedure is used until the incremental change is less than 5%. However, if a spreadsheet program is used for computation, incremental changes can be made, as little as 1% or less. A variety of simulation software is available that provides mass balance calculations. Example 2.1: Computation of Solids Mass Balance This example illustrates the preparation of solids mass balance for a hypothetical wastewater treatment plant. Figure 2.7 is a flow schematic of the plant. 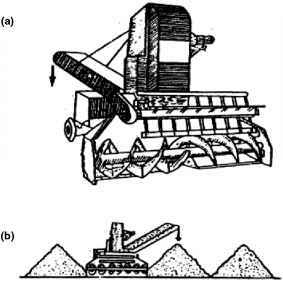 Some of the units for sludge processing shown in the figure are typical equipment and processes, and similar equipment and processes may be substituted depending on the selection and design of the sludge handling system. For example, a gravity thickener, floatation thickener, or centrifuge thickener may be substituted for the gravity belt thickener. However, the appropriate characteristics of the processed sludge and solids capture efficiencies, shown in Tables 2.8 and 2.9, should be used in the mass balance computations. Note: g/m3 and mg/L are numerically the same. 4. Plant effluent: In the first iteration, assume the plant effluent flow to be the same as the plant influent flow, although this may vary depending on the recycle flows and primary sludge and WAS flows discharged to the sludge processing system. Note: In reality, the substrate in the effluent (influent soluble BOD escaping treatment) should be determined based on the BOD of the biodegradable effluent TSS. However, the error in using the effluent BOD as the effluent substrate is negligible. In sizing the aeration basin, some designers ignore the effluent BOD altogether, as it is usually a small amount. Belt wash water flow and the weight of polymer are not considered in the mass balance calcwulations. Belt wash water flow and the weight of polymer are not considered in the mass balance calculations. 10. These new recycle quantities should be used for the second iteration of mass balance, and if needed, additional iterations should be performed until the change in quantities of the recycle is less than 5%. If mass balance calculations are performed using a spreadsheet program, additional iterations are easier and can be repeated until the change in quantities is 1% or less. 12. The quantities of flow (m3/d), BOD (kg/d), and TSS (kg/d), after the second iteration, for all the unit processes of treatment are shown in Figure 2.8.